1. PDF DOCUMENTS: These are PDFs that contain submission data. You can include these as email attachments to your Notifications and Autoresponders. 2. FILLABLE PDF FORMS: These are PDF forms that can be filled out using a PDF Reader. Some notable readers are Adobe Acrobat Reader and Foxit Reader. For this article, we'll be focusing on the second type of PDF - Fillable PDF Forms (skip to this section for the steps). 🔗 What Is a Fillable PDF Form? A fillable PDF form is just like any regular form but in .pdf file format. Respondents can use any PDF reader of their choice to fill it out and submit it. 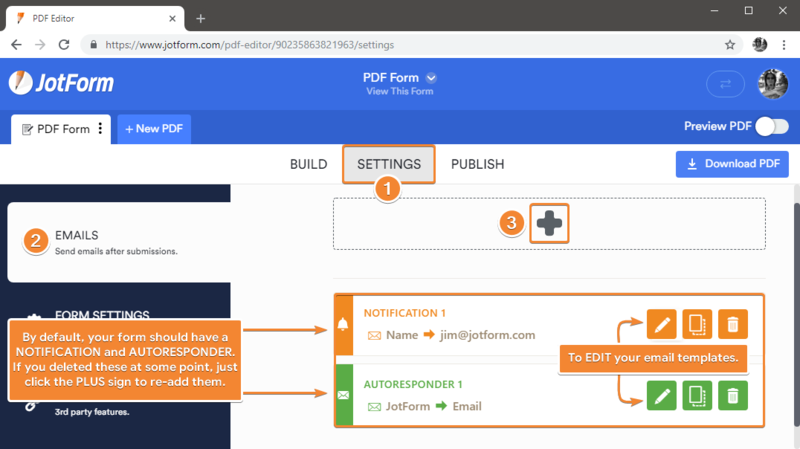 With JotForm’s Fillable PDF Form Creator, you can generate customized PDF forms with blank fields that allow people to fill it out on their digital devices, submit it, and share that information with you automatically. These submissions can be sent as email alerts and will be saved in your form's Submissions Page. 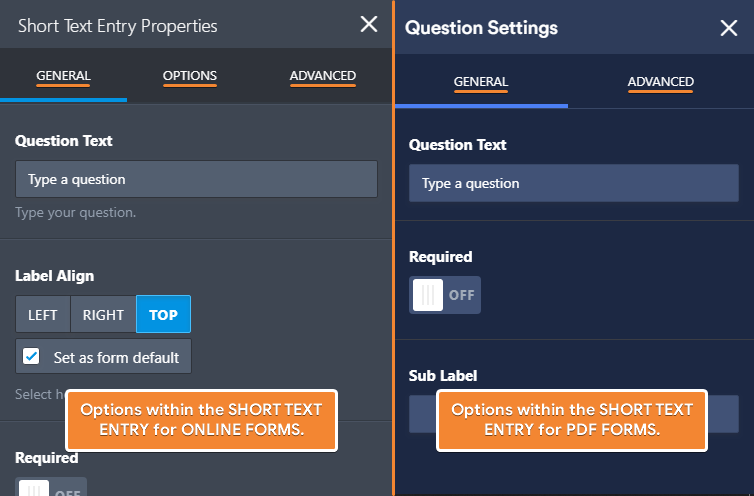 🔗 What's the Difference Between a PDF Form and a Web Form? We'd love to hear your thoughts on which features and options you want to be added. So, head over to our Support Forum (or leave a comment/suggestion below), tell us what you need, then we'll take it from there. 🔗 When Should I Use Fillable PDF Forms? A. Kiosk terminals or tablets on the go. Users can fill out the PDF form > submit it > then the next respondent in line can hop in and do the same (rinse and repeat). B. Ease of sharing across multiple channels. Since you're essentially sharing .pdf files, you can share it in a variety of ways - From emails and chats to social media, online cloud storage, CRMs, and more. C. Compatibility with all devices that have a reader installed. Online web forms work great in all modern browsers, and PDFs are expected to behave the same across different devices and readers as well. D. A reliable alternative to online web forms. If your respondents can't fill out and submit your form using their browser, a backup version of your online web form in .pdf format is a great resource. 🔗 How to Create a PDF Form? There are several ways to build and design a PDF form. METHOD 1: Start from scratch. 1. With the PDF Editor page open, click the ➕NEW PDF tab. 2. Select the NEW PDF FORM option. 3. On the BLANK section of the modal popup, click the CREATE NEW PDF FORM button. During this process, a new WEB FORM will also be created in the background. So, it's normal to see a new form named "PDF Form" when you go back to your MY FORMS page. NOTE: If you're only seeing two options (BLANK and IMPORT), this means you already have an existing fillable PDF for the form you're currently working on the PDF EDITOR. METHOD 2: Import an existing PDF form. Following the same procedure above, instead of starting with a blank template, you can also IMPORT your own fillable PDF form. This time, click the IMPORT PDF FORM button. To learn more, you can refer to the article linked below. TIP: The link to generate FILLABLE PDF FORMS is also available from our Fillable PDF Form Creator landing page. METHOD 3: Convert one of your existing web forms into a PDF form. 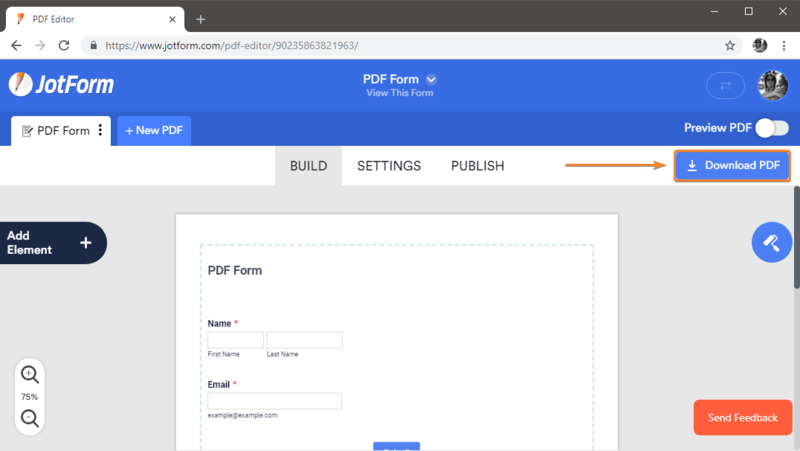 If you've been using JotForm and have web forms already built, you can create fillable PDF versions of these web forms. 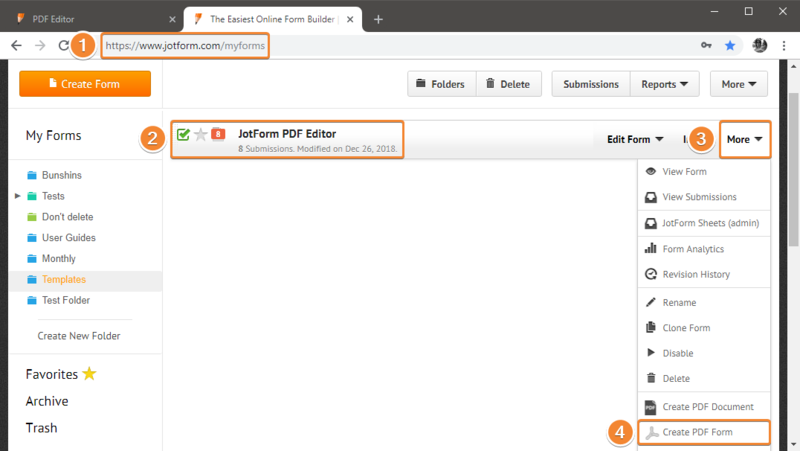 Following the same process explained above, instead of creating a blank PDF form, or importing one, you can use the current form loaded in your PDF EDITOR and convert it into a fillable PDF form. Just click the CREATE PDF FORM button. A. Go to your MY FORMS page. B. Select the form you wish to convert. D. Then click CREATE PDF FORM. IMPORTANT: What this means is that changes you make to your PDF FORM will reflect to your WEB FORM. For example, if you delete a field while designing your PDF form, that field will also be deleted from the web form. It will also list the fields and widgets not supported in fillable PDF forms. Here's a short demonstration showing that. For this example, we're just deleting the Email Field from the fillable PDF form. Notice that after reloading the page, the web form and form builder both lost the email field too. Once you're done building and designing your PDF form, it's time to configure email alerts. Just like a web form, a PDF form can trigger NOTIFICATIONS that will be sent to you, and AUTORESPONDERS that will be sent to your respondents. By default, these emails are automatically added but if you don't see any, click the SETTINGS tab at the top > EMAILS on the left > then click the ➕ icon to create one. This would be the best time to integrate with 3rd party platforms (e.g. Google Sheets, Drive, Dropbox, etc.) if necessary. On the same page, just click INTEGRATIONS on the left to get started. Finally, it's time to download the PDF form. This is pretty simple, just click the DOWNLOAD PDF button at the top right hand corner of the PDF EDITOR. Hi, I created a template in the PDF editor, and it is not working once I use the template that I created. I have 2 templates in the PDF editor, the one is working and the other one is not. We are having major issues with our forms turning into PDFs with Editor. Is there a way to have them look like they used to? Is it possible to import a web form to fillable PDF and edit it without changing the web version?